So if you live in Vancouver, you may want to check this out! My friend and I stumbled onto this while we were walking around downtown waiting for our friend’s birthday party to begin. 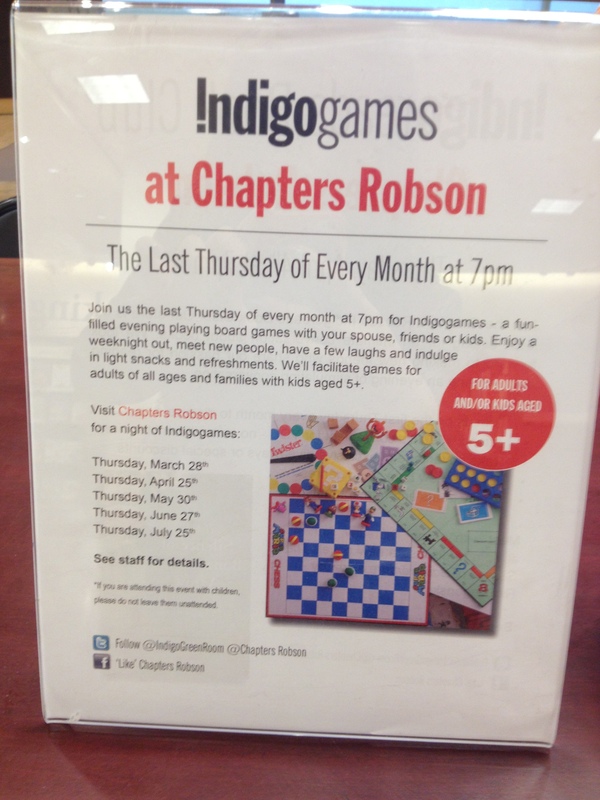 Did you know that Chapters (the one near Howe street in downtown Vancouver) has board games night! It happens on the last Thursday of every month (according to the poster, up to July anyway), and it is free! They had two tables and board games scattered around for you to play with. What is even better? They serve popcorn and juice! It starts at 7PM, and our friend’s birthday party did not begin until 7:30, so we decided to sit down and join a game of Taboo! They also had Jenga, Apples to Apples, and the other table was playing some sort of complicated card game. We met a nice group of people, and our table eventually started to grow. 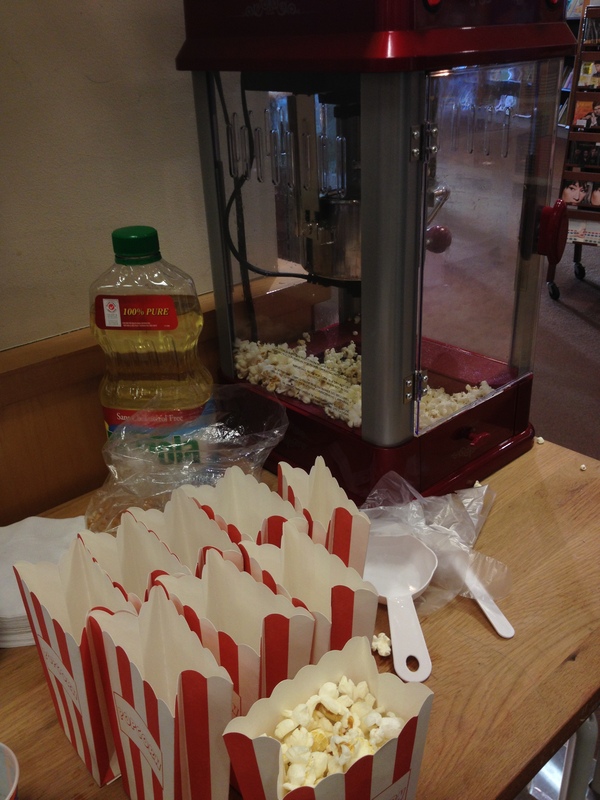 The staff kept offering popcorn and drinks to everyone, and it was definitely fun! Shame we could not stay longer! 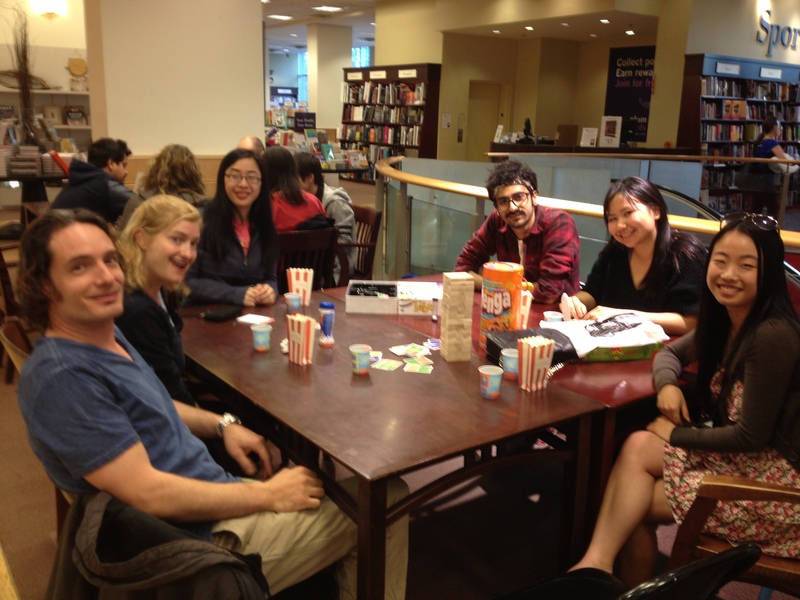 So if you are downtown on a Thursday night, and it happens to be the last one that month, you may want to drop by Chapters and play a game or two with strangers! It goes on from 7:00PM- closing (which is around 10PM I believe)! Hope you guys are enjoying the sun! Oh wow can’t believe I didn’t find out until now. I love board games and will definitely check it out. Thanks for sharing!